1. Yelena Kiseleva and Yegor Popov article headlined "Sergei Chemezov Implants Chips" says that the government will soon hand over its stakes in 16 companies to the Russian state corporation Russian Technologies, which will launch production in the microelectronics and fire-fighting equipment industries; pp 1, 7 (870 words). 2. Kirill Belyaninov and Gennady Sysoyev article headlined "Proper Cancellation of Jackson-Vanik Amendment" says that U.S. Congress, which planned to replace the Jackson-Vanik amendment with the Magnitsky bill, is now seeking additional measures to control the Russia's compliance with WTO rules; pp 1, 6 (638 words). 3. Dmitry Butrin and Alexander Chernykh article headlined "CPRF Included in School Curriculum" says that the bill on education will be discussed today at a government meeting before submission to the State Duma on July 26. The bill does not envisage drastic changes to the education system, so the Communist Party of the Russian Federation has agreed to back it if the party's proposals are taken into account in the final version; pp 1-2 (786 words). 4. Sergei Sobolev article headlined "TV Channels to Muffle Music" says that the Russian music TV channel Muz-TV will be rebranded and renamed into the TV channel YU in the autumn. Another music TV channel, MTV Russia, may be closed down in 2013. Low ratings of both TV channels are behind the moves; pp 1, 10 (719 words). 5. Irina Nagornykh et al. article headlined "Central Elections Commission Reshuffles Staff" says that the Central Elections Commission has recommended candidates for the chairmen of the elections committees in the Orenburg, Omsk and Ivanovo regions; p 2 (623 words). 6. Alexei Shapovalov article headlined "They Propose to Calculate GDP in Autumn" says that the Economic Development Ministry expects Russia's economic growth to speed up in the second half of the year, although recent macroeconomic research by the ministry did not find anything in support of this suggestion. Meanwhile, the European Bank for Reconstruction and Development has decreased its forecast for Russia's GDP growth in 2012; p 2 (599 words). 7. Sofya Samokhina article headlined "Boris Titov Grows Structurally" looks at how the job of the Russian business ombudsman will be organized; p 2 (571 words). 8. Viktor Khamrayev article headlined "Krymsk Received Faked Alarm" says that President Vladimir Putin has attended a meeting of the interdepartmental commission set to deal with the aftermath of the flood in the Krasnodar region. At the meeting, Investigations Committee head Alexander Bastrykin blamed the Krymsk town authorities for the tragedy; p 3 (939 words). 9. Natalya Korchenkova article headlined "People Want to Recognize Faces of 'Foreign Agents'" says that a public opinion poll conducted by the All-Russia Public Opinion Research Centre (VTsIOM) has shown that 67 percent of Russians consider the law on foreign-funded NGOs a good measure to prevent foreign interference in Russia's domestic affairs. Only 16 percent of respondents think that the law is meant to suppress the opposition; p 3 (597 words). 10. Konstatin Voronov and Yana Yanushkevich article headlined "Disposal of Ammunition Begins on Road" says that yesterday a freight train carrying outdated ammunition to a disposal site caught fire and partly exploded in the Novosibirsk region; p 4 (564 words). 11. Alexei Sokovnin article headlined "Rasul Mirzayev Appears Before Website" says that the trial of street-fighting champion Rasul Mirzayev, charged with delivering a fatal blow to a student, has begun in Moscow's Zamoskvoretsky Court. The court hearing was broadcast online; p 4 (579 words). 12. Andrei Smirnov article headlined "Attempted Murder of Tatar Muftis Not Spotted in Books" says that four men detained on suspicion of the attempted murder of Tatarstan's Mufti Ildus Faizov have been released; p 5 (611 words). 13. Oleg Rubnikovich et al. article headlined "Party Sideslip" says that A Just Russia members Leonid Karagod and Vladimir Myasin, charged with an attempt to sell a State Duma seat to a businessman for 7.5 million euros ($9.1 million), have received short prison sentences, half of which they have already served while the investigation into the case was conducted; p 5 (665 words). 14. Maxim Yusin article headlined "Syria Exports Civil War" says that the conflict in Syria may trigger a civil war in Lebanon. Experts warn that Iran may take advantage of the move to strengthen its geopolitical influence in Lebanon; p 6 (409 words). 15. Kirill Belyaninov and Yelena Chernenko article headlined "Pentagon Strips Russia of Secret Access" says that the U.S.A. has invited Russian representatives to attend the tests of its missile defense system on the Kwajalein atoll in the Pacific Ocean, one of the most secret facilities of the Pentagon, but later changed its mind; p 6 (744 words). 16. Maria Yefimova article headlined "Israeli Prime Minister Gathers Majority to Suppress Iran" says that the Israeli prime minister has offered ministerial posts to supporters of tough actions against Iran; p 6 (422 words). 1. Tatyana Ivzhenko article headlined "Kiev Takes Moscow's Hint" says that Ukrainian President Viktor Yanukovych has submitted to the Ukrainian parliament a bill seeking to ratify a free trade agreement in the CIS. Russia's hint at new trade wars with Ukraine has probably influenced the situation, the article says; pp 1, 4 (971 words). 2. Sokhbet Mamedov article headlined "Aliyev Begged to Stay Third Term" says that Azerbaijan's ruling party has nominated the incumbent president of the country as its candidate in the next presidential election to be held in 2013; pp 1, 6 (495 words). 3. Igor Naumov article headlined "Open Government Blows Off Steam in Myasnitskaya [Ulitsa]" says that Prime Minister Dmitry Medvedev has met experts from the Open Government project to discuss the education bill at one of the premises of the Higher School of Economics, causing traffic jams in central Moscow; pp 1, 4 (734 words). 4. Vladimir Skosyrev article headlined "Chinese Economy Lands Softly" says that the Chinese economy has been gradually overcoming a setback in manufacturing thanks to measures taken by the authorities; pp 1, 7 (645 words). 5. Vladimir Mukhin article headlined "Soldiers' Mothers Interfere in Syrian Issue" says that according to the nongovernmental organization Soldiers' Mothers of St. Petersburg, young conscripts, who should not serve in military conflict zones, are among the crew members of Russian military vessels heading for Syria; pp 1, 2 (558 words). 6. Editorial headlined "Will We Greet November With Guns in Our Pockets?" says that a referendum on legalizing short-barreled firearms in Russia may be held in late September and lists the disadvantages of free firearms trade, which concern Russians; p 2 (537 words). 7. Ivan Rodin article headlined "Internet 'Bums' in White House [Seat of the Russian Government]" says that the website of the Russian government, which has been operating for two months, lacks information about certain ministries, including not only their websites, but also their addresses and contact information; p 3 (707 words). 9. 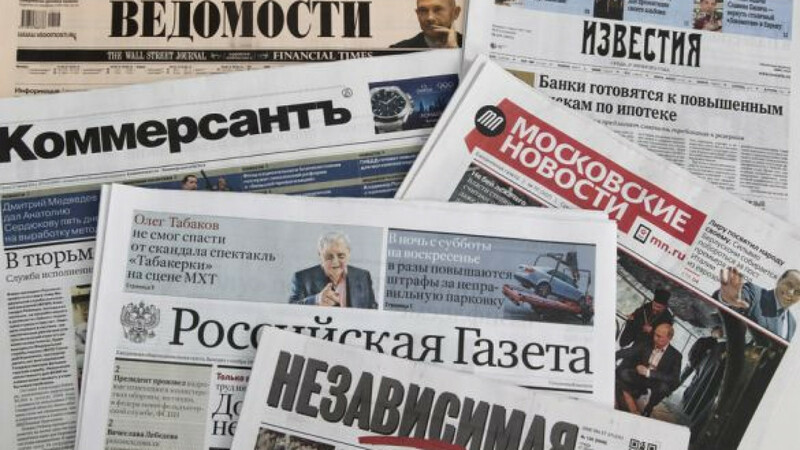 Alexei Gorbachev article headlined "Rally Against 'Bolotnaya Case' Not to Be Crowded" says that a rally in support of those detained as part of the criminal investigation into the May 6 unrest on Moscow's Bolotnaya Ploshchad will be held today in Moscow. The organizers of the rally promised not to violate the law and hold the rally as agreed with city authorities; p 3 (722 words). 10. Grigory Mikhailov article headlined "U.S.A. Wants to Keep Airbase in Kyrgyzstan" says that the U.S. Congress has debated the future of the U.S. military base Manas deployed in Kyrgyzstan. Washington is holding talks with Bishkek on the future of the U.S. military contingent in the republic; p 6 (712 words). 11. Yury Paniyev article headlined "Mitt Romney: 'Reset' Is Betrayal" says that Republican presidential candidate Mitt Romney has accused the White House of "betraying national interests" referring to the reset policy with Russia. Romney is on his first foreign tour: he will visit Britain, Israel and Poland; p 7 (749 words). 1. Ksenia Boletskaya article headlined "Sentence From Mikhalkov" says that the first criminal proceedings on copyright violations have been launched in Russia following a complaint from the Russian Union of Copyright Holders; p 1 (700 words). 2. Yevgenia Pismennaya and Yekaterina Kravchenko article headlined "State to Take Pensions" says that Deputy Prime Minister Olga Golodets has suggested reducing wage contributions to the accumulated component of pensions from the current 6 percent to 2 percent and using the saved money to cover the Pension Fund's deficit; pp 1, 3 (700 words). 3. Yelena Vinogradova and Anton Filatov article headlined "Master of Champion" says that businessman Arkady Rotenberg, an old friend of President Putin, will become the owner of the Moscow-based hockey club Dinamo; p 1 (400 words). 4. Editorial headlined "God, Please, Do Not Burn" criticizes the Russian authorities' forest management policy in the light of serious wildfires in Siberia and the Far East and says that people in Siberia literally prayed for rain; pp 1, 4 (500 word). 1. Vladislav Kulikov article headlined "Not Allowed in Jail" says that the Federal Prison Service has suspended the employment of new workers because there are plans for reorganizing the agency; pp 1, 7 (800 words). 2. Kira Latukhina report headlined "Not Guilty Until Court Rules" describes President Putin's visit to the Krasnodar region to inspect the progress of work to eliminate the aftermath of the flood; p 2 (1100 words). 3. Tamara Sergeyeva article headlined "Fight of Nanay Boys" looks at the fight against corruption in Russia and its results; p 5 (1100). 1. Anna Reznikova article headlined "It Will Be Bad or Worse" says that experts from the Higher School of Economics have drafted two scenarios of Russia's economic development within the next three years. Both scenarios are pessimistic; p 1 (500 words). 2. Yelizaveta Sergina article headlined "Advertising Heat Felt on Internet" says that the largest Internet companies Facebook, Mail.ru Group and Google may be found guilty of violating the new law prohibiting advertising of alcoholic beverages online. The Federal Anti-Monopoly Service will carry out a probe into the issue; pp 1, 10 (300 words). 3. Galina Starinskaya article headlined "Rosneft to Be Reshaped" says that a substantial reshuffle is expected in the Russian oil company Rosneft; p 6 (600 words). 4. Olesya Yelkova article headlined "Sibur and TNK-BP Add On Gas" says that the Sibur oil holding company and the Russian-British joint venture TNK-BP have decided to launch yet another joint project; p 6 (500 words). 1. Anastasia Alexeyevskikh article headlined "Banks Expect Ruble Devaluation in Autumn" says that according to research conducted by the Higher School of Economics and the Corporate Financing Bank, banks earned 74.2 billion rubles (some $2.25 billion) in May on ruble devaluation. The research forecasts another ruble devaluation in August; pp 1, 4 (800 words). 2. Roman Vetrov article headlined "Russian Interior Ministry Revives Legendary RUBOPs" says that the Interior Ministry's district directorates for combating organized crime, which were disbanded in 2008, may be re-established in Russia this autumn; pp 1, 4 (800 words). 3. Anastasia Rudakova article headlined "Customs Union Produces No Results So Far" says that trade turnover between Russia, Belarus and Kazakhstan has not changed after the Customs Union was set up two years ago; pp 1, 4 (500 words). 4. Anna Polyukhovich article headlined "Highly Explosive Billions" says that the fire onboard a military train in the Novosibirsk region has become the seventh accident linked to the disposal of outdated ammunition since the beginning of the year. Russia will spend 39 billion rubles (some $1.18 billion) on getting rid of outdated ammunition in 2011-20; p 1 (200 words). 1. Margarita Alekhina et al. article headlined "Volunteers Against Will" contemplates a bill that seeks to regulate the work of volunteers in Russia and features experts' comments on the issue; pp 1, 5 (1,099 words). 2. Anastasia Maltseva and Alyona Kutyrkina article headlined "We Lose Him" says that Karelia blogger Maxim Yefimov, accused of extremism for criticizing the Russian Orthodox Church, has fled from Russia; pp 1, 5 (410 words). 3. Anatoly Stepovoi article headlined "Agents of His Majesty" says that Russian human rights activists have split over the law toughening control over NGOs financed from abroad. Some are opposing the law, others are ready to adjust to it; p 2 (624 words). 4. Nikolai Snezhkov article headlined "From Now on He Threatens Russians" says that Republican presidential candidate Mitt Romney intends to run his election campaign focusing on criticizing President Barack Obama and Russia; p 2 (461 words). 5. Vladimir Stolyarov article headlined "Investment in Russia's Future" says that the Russian oil company Rosneft plans to buy BP's stake in the Russian-British joint venture TNK-BP; p 3 (728 words). 1. Sergei Frolov article headlined "Do We Become Kinder When We Arm Ourselves?" criticizes Federation Council senator Alexander Torshin's initiative to legalize short-barreled firearms in Russia; p 2 (522 words).